At Dallas Cosmetic Dentistry, we take pride in our talent to provide the best oral healthcare, while also delivering deluxe dental services to our patients. An important element of our work is being attentive to medical innovations – studying new and budding health methods that safeguard our patients – so you can receive the most effect cosmetic treatments possible. Like many of us who struggle with misaligned teeth – you may think that unpleasant traditional braces are the sole solution to crooked teeth or an uneven bite. While conventional wire braces (as the “tried and true” method for many doctors) are fairly successful in their own right, we believe that they can often be ugly and uncomfortable. As Dallas, Texas’ premier Cosmetic and Family Dental practice, Dr. Alhadef has refined alternative treatments for patients who think that they’re teeth could be straighter. With clear Invisalign dental aligners, you don’t need to suffer through the humiliation of having the old “bars and brackets” in order to have the smile of your dreams. What do Invisalign aligners do? Invisalign is already one of the most in demand – and effective – dental treatments on the market today. Is Invisalign different from traditional braces? 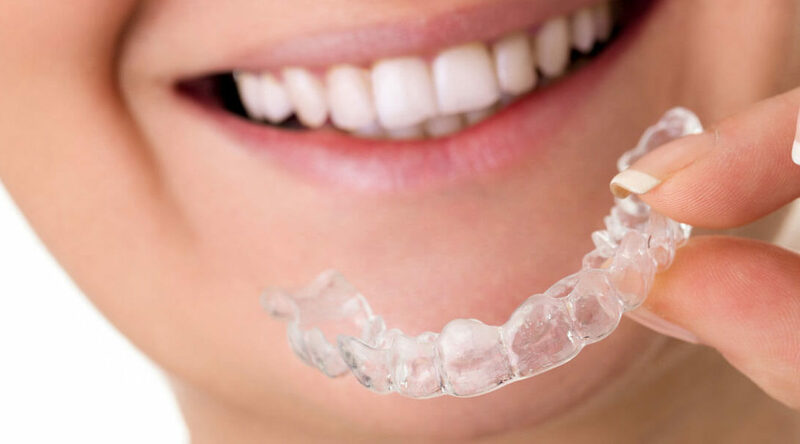 Different from traditional wire braces, Invisalign dental aligners are completely translucent and detachable. Also, after over twenty years of watching Invisalign “in action” dentists have noted that Invisalign treatments are just as helpful at solving problems that could have otherwise needed more complicated procedures. Clear Invisalign dental aligners reach their remarkable results by employing a succession of aligner trays that softly hug your teeth, directing them to their appropriate location and orientation. Made to order by your dentist using cutting-edge 3-D crafting/printing, you will know that your customized trays maintain a secure – yet comfortable – fit the moment you first try them on. Two weeks after you get your first tray, you will be given a new tray to account for the improvements you’ve experience, while also encourage further progress. Most likely, you will begin to see improvements within the first week of treatment! However, about one to one and half years of continued care by your doctor is required for most cases. But, individual experiences differ from mouth to mouth. The total cost of Invisalign fluctuates from region to region and person to person. However, it may surprise you to learn that Invisalign costs are very similar to their outdated partner – braces. Invisalign treatments are almost identical in price to metal braces even though they offer similar benefits. Most traditional braces can cost anywhere between $3,000 and $7,000; while Invisalign can cost anywhere from $4,000 to $7,400. For example, ceramic braces can cost almost 10 Grand! Obviously, Invisalign clear dental aligners are easier on your check book, and state of mind. It’s likely that you are already an excellent applicant for Invisalign. To know for sure, we recommend consulting with a member of the Dallas Cosmetic Dentistry team. Can I switch to Invisalign if I already have braces? Many times, you can switch from traditional brace to Invisalign in order to complete your realignment. However, you should double check with your doctor. How do I maintain my Invisalign aligners? Brush them inside and out with your toothbrush and toothpaste under lukewarm water. We also recommend brushing and flossing your teeth as normal during treatment. Does Invisalign require “after care”? We typically advise our patients to use some sort of dental aligner as part of your smile maintenance after treatment. The Dallas Cosmetic Dentistry team is ready to help you achieve the smile you’ve always dreamt of. Call us at (214) 368-2434 or visit us at DallasCosmeticDental.com to schedule a pressure-free consultation today!